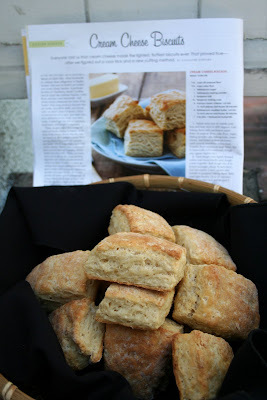 In the last issue, there was a recipe of biscuits, the photo just caught my eyes. They looked soooo good! And, I immediately decided to add cream cheese to my shopping list. Just as I thought, I knew it from first sight that these biscuits would be great! And, they were so easy to make, too! You mix all ingredients in a food processor and add butter and cream cheese then mix together with butter milk, that's it. I don't use buttermilk so often, but I soon realized the differences from the other biscuits I have been making, and really tasted what buttermilk can do to the dough, which was so soft, moist, and an excellent taste.